Mattress buying is notoriously a lengthy and time-consuming task which nobody looks forward to. It usually results in a full day of going from bed store to bed store being hounded by salesmen along the way that encourages you to upgrade and buy all the additional add ons, even if you didn't need or want them. 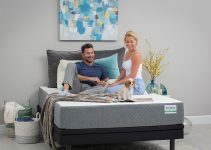 Leesa is amongst the new breed of mattress retailer that operates exclusively online and have gained a significant amount of news attention over the last 12 months. It can be challenging to purchase a mattress even in person, so carrying out the process online can seem more complicated, but it's a breeze. We have created this detailed Leesa mattress review to take the guesswork out of your decision and show you whether the mattress is worth the hype, or just another slick sales pitch. Leesa is an online mattress retailer with the sole mission to help people sleep better by designing, creating and selling mattresses that can be delivered straight the customers home. The company was initially formed in the US but has returned to its founders' roots in the UK and is manufactured right here in England. The founders had the same problems that many of us have when buying a mattress and vowed to change the whole experience, in a much more streamlined process. Leesa has removed all the guesswork associated with buying a mattress, by creating a universal mattress that is suitable for everyone to use. Because of cutting out the traditional showroom, the Leesa mattress can be sold at a much more affordable price with a simple pricing structure. This mattress has comfortably found its way into our highest recommended choices. From the base up the mattress is constructed using premium high-quality materials to not only provide a comfortable sleep but also to ensure the mattress is durable. 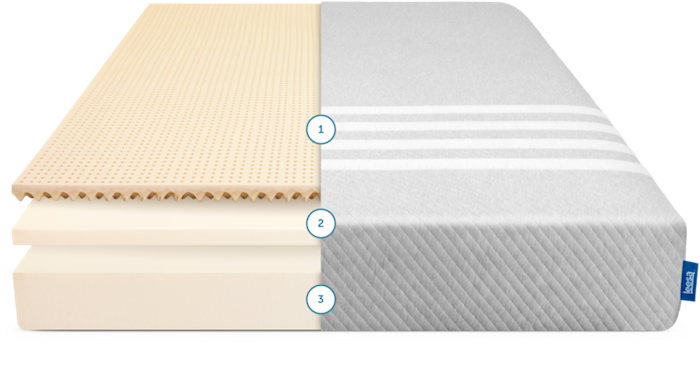 Four unique layers make up the mattress, with each layer complimenting the other and working together to support and comfort. The mattress is covered in a woven polyester-lycra blend fabric that has a cool feel but is also has a silky soft type touch. It is constructed using a single piece of material, so the edges are seamless for increased levels of comfort. The cover also has the iconic four stripe Leesa logo etched on the top side. Beneath the top cover of the mattress is a 5cm thick layer of cooling foam which encourages airflow to regulate the temperature of the user throughout the night. The foam also has cushions while also providing enough bounce for the user. This layer solves the common complaints about memory foam that it overheats and it can feel like quicksand as you sucked into the layer. The middle layer is made up of 5cm thick memory foam that has excellent contouring capabilities to cushion and relieve the pressure from the most vulnerable areas of the body such as the back, spine and hips. It does everything that you expect from high-quality memory foam. The mattress is finished off with a core 15cm thick support foam layer which acts as the foundation for the mattress. This layer brings overall support and strength to the sleeper. It does this without feeling overly firm on the surface. If you're someone that's used to having to drag yourself into many mattress stores, usually with your spouse, then you're in luck because those days are now over. In just a few clicks you can quickly order your Leesa mattress. Not only is the traditional mattress buying process time consuming but it can also be a stressful process, all this is now removed. Now it's just a case waiting a few days for it to arrive via courier. Another great thing about this process, is you don't need to take days of work to sit at home waiting for the delivery like you would with a traditional mattress online store. Because the mattress is delivered compressed, it could even be delivered to your place of work then you could drive it home. The box can still be heavy for some especially the larger mattress sizes, so we'd always recommend you have it delivered to your home, where possible. The Leesa mattress will arrive at your door within 3-5 working days and comes fully compressed and vacuum packed into a shipping box. The size of the box is surprisingly small measuring just 40cm x 40cm x 106cm, and the box also has well-positioned carry handle holes to help you move it to your desired bedroom. Interestingly, compressing a mattress in this way improves the overall performance of the mattress making it last longer without deterioration. The mattress does need a few hours to expand into its full size once it's been removed from its box. Those who are not new to memory foam products will be aware that it can sometimes have an odd odour initially, but of course, this will disappear within just a few days. This process can be sped up by keeping the room well ventilated. So is it comfy to sleep on? That's all that matters, isn't it?. The first impression that the Leesa mattress gives when you sleep on it is the coolness and freshness throughout the whole night. This cool cover has eradicated the issue of waking up in the middle of the night covered in sweat. Online mattress companies often don't give their mattresses a firmness rating due to the universal nature of the product, though if I had to put this mattress on a firmness scale, it would be a 5.5-6, so it is suitable for side, front and back sleepers. The mattress provides a nice balanced feeling, so you do feel snug in the mattress, but there is also an underlying firmness that you can feel supporting you. It certainly lives up to its hybrid title. When you lie on your back, you can feel the firmness kick in supporting your back keeping it aligned and in a restful position. The mattress is extremely responsive, and there is no delay when you do change your sleeping position as you can feel the mattress continuously contouring to your new position. While you do sink into the mattress, this creates a snug feeling and not an overwhelming hot feeling that you sometimes experience with memory foam. There is slightly less edge support than you may be used to because there are no raised edges due to the seamless design. However, this is great for me as in the mornings I roll out of bed to start the day. Motion transfer is hugely important, and the Leesa mattress has tackled the issue in great fashion. There is little motion transfer which is ideal for couples, so if one of you wake up earlier in the morning or is a restless sleeper, then the other person will not be woken up as they won't feel the movement. Like any new mattress, it does take a couple of nights to truly get used to it because its a unique experience and you're used to your previous mattress, so I'd encourage you to be patient if you've only slept on it for one night. You'll start to feel the benefits of the mattress begin to kick in, and a big sign is when you feel refreshed and energised in the morning following a high quality sleep. Included with every mattress purchase is a 100-day sleep trial, which allows you test the bed and if you don't enjoy the experience, then you can call Leesa and arrange for collection and receive a 100% refund with no questions asked. This shows that they are fully confident that their mattress will improve the quality of your sleep. This guarantee takes the pressure off your buying decision and allows you to relax and take your time when trialling the product. This makes it a lower risk than even buying directly from the showroom floor. A 10-year warranty is not a new concept that's been introduced, especially for online mattress retailers. However, this is one of the broadest guarantees that are available and does cover a lot of potential defects. This includes any physical flaw or if there is an indentation more significant than 1 inch thick. Of course, the warranty does not cover damage caused by improper use. This warranty provides added peace of mind that the mattress will have the same lifespan as the average mattress. Although this hasn't been officially proven in medical studies, There have been many users who have been suffering from sleep-related issues such as insomnia or back pain which had cleared up when they started to use the Leesa mattress. It is especially effective for back pain due to the spine aligning qualities of the mattress which relieves tension and pressure. So if you suffer from a sleep-related problem, then this mattress could be the cure. Since the company first launched, Leesa has made a strong conscious effort to give back to the community and make a difference. For every ten mattresses that they sell they donate one mattress to organisations that serve homeless and at-risk men, women and children to help them better their lives. This has resulted in over 5,000 mattresses being donated. The Leesa mattress is manufactured and assembled right here in the UK, so not only will you be on your way to a night of better sleep, but you'll also be contributing to the local economy and supporting a thriving industry. The 4-layer unique system is a superb advancement on the traditional block of memory foam. It not only supports and comforts but provides cool airflow to keep you refreshed throughout the night. This creates a balanced feeling regardless of the position that you sleep in. It sounds cliche, but it is the perfect level of support, firmness and comfort and meets almost every need you could want from a mattress. Considering the high-quality materials, the mattress is very reasonably priced. If you were to buy an equivalent mattress from a department store, you'd end up spending around 40-50% more. Although this is a superb universal mattress suitable for almost all preferences, if you have particular medical needs then this will not be the mattress for you. For instance, if you have a disability or mobility issues, then it would be recommended that you look for a bed that is specialised for that purpose. If you're a couple who weigh 25+ stone each, then this mattress will not be able to support your bodyweight as effectively as it would for a person who is lighter, especially if you have excess body weight around the stomach and you tend to sleep on your front. You know a quality product when you use it, and with the Leesa mattress, you can see the workmanship and time that has gone into developing the product. From the carry handles on the shipping box to the Avena cool air flow layer to keep you cool throughout the night. This mattress will no doubt become an essential part of your life especially considering you spend over 35% of your life sleeping. When you consider it also has a 100-day trial and 10-year guarantee it almost makes it a no brainer and I struggle to see how anyone could regret purchasing it. We hope we have displayed how lovely it is throughout this Leesa mattress review. The price point is a steal, and they could easily be charging around double. 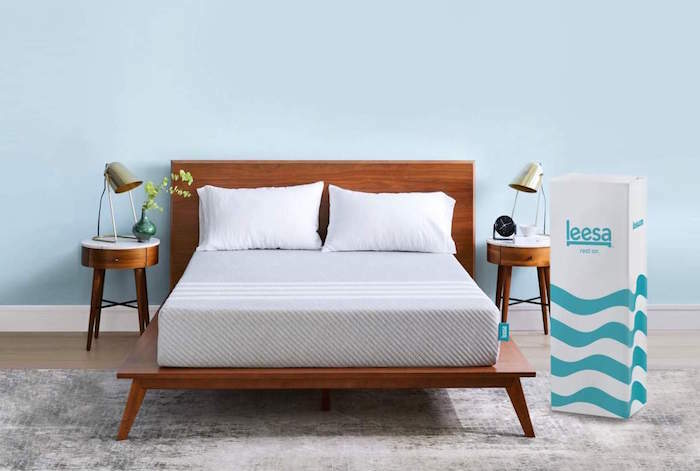 The Leesa mattress does provide a balanced feel without sucking you deep into the memory foam and has enough bounce to provide exceptional support. It would be a struggle to find many mattresses within this price bracket that offers superior performance.